What a week! 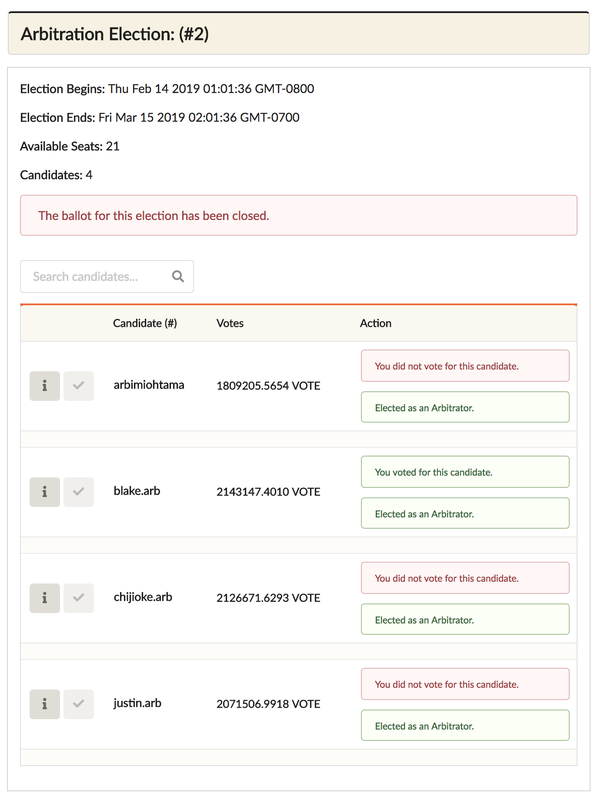 Pi Day, The Ides of March (or as I call it, Leftover Pie Day), and the world’s first smart contract controlled election of blockchain arbitrators wraps up with four candidates elected. Not bad. I wonder what St Patrick’s Day will bring. A big scandal broke in the US about people paying to fake test scores and elite sports participation in order to get into top colleges. Every time I hear about one of these things, I am reminded of why blockchain is important. We could build a test score platform on Telos that would be both private and immutable. Anyone that you enabled to verify that the scores you submit are real could do so, without getting any other information about you. I could describe the makeup of this system well enough to build it in an hour or two. And because Telos is a truly decentralized public blockchain, no government or set of elites could change these values or force fake ones onto the chain. Problem solved. Of course, no system can solve all problems. The reason why blockchain is such a good solution to so many problems is that a lot of the important issues in modern life stem from the problems of massive power disparity between the haves and have nots that allow those in power to constantly tilt the playing field in their own (or their kids’) favor, and the lack of transparency that lets this fester. A truly decentralized public blockchain can address both of these. Add the problem of people’s private data rapidly becoming the property of a few massive tech companies — which can also be resolved with blockchain, and you have a whole lot of major modern day problems that can be addressed with this technology. However, as blockchain addresses these problems, it’s even more important to ensure that the chain in question is truly and sustainably decentralized and won’t just fall under the control of those same elites. We built Telos to be the most sustainably decentralized blockchain in existence, so that it can stay that way. As we reach important milestones, like electing our first arbitrators, and worker proposals approaching passage, the chain grows stronger and so does the potential for this antidote to so many problems that Telos can offer. The first Telos arbitrator election ballot — the first election of its kind ever — has concluded. Congrats to the four arbitrators who were elected. History made! A new arbitrator election ballot will begin shortly. Arbitrator candidates will have seven days from the start of the ballot to register themselves before the next round of voting begins. This week’s featured proposals are both new. Be sure to vote! 300,000.0000 TLOS times 4 cycles to ‘wordprooftls’ to fund an open source Telos WordPress plugin. There was an error in submitting this proposal. The proposer meant to submit 4 cycles at 75,000.0000 TLOS each for a total of 300,000. Since the proposal cannot be modified, the proposer has made an update on-chain, asking for the full 300,000 TLOS for the first cycle which will get the WordPress plug-in created quickly for an upcoming conference and for any additional cycles that pass, he will return 225,000 TLOS and use the remaining 75,000 TLOS to further develop WordProof. Telos has a community on Lumeos now! New use for ACORNs discovered! EOS World Expo is happening next month! Telos made history this week by concluding the first ever smart-contract controlled election for arbitrators in blockchain. All four candidates crossed the 1 million-vote threshold to become qualified for election. A new election for additional arbitrators will begin shortly and candidates will have one week to register to be eligible to vote. Elections will continue as long as there are fewer elected arbitrators than the number of seats set by block producers. That number is currently 21. The Telos Foundation board has been working hard to get TLOS listed for trade on exchanges. Their first big milestone it to get TLOS listed on the blockchain industry’s most important list of tokens, CoinMarketCap. CMC is essentially the “official” list of “real” blockchain projects. To be listed, a token needs to be traded with a certain level of volume on 2–3 of the exchanges listed by CMC. None of the exchanges currently listing TLOS are on the CMC approved exchange list, and so the TF board needs to use its limited funds carefully to pay for listing fees. The first exchange they announced is a good one. P2PB2B not only lists TLOS with BTC and ETH pairs, but with direct fiat pairs for US dollars and Ukranian currency. P2PB2B is in the top 20 CMC exchanges in terms of 24-hour trading volume. The time to activate TLOS trading is not certain, but the expectation is about a week. Also this week, the TF board has signalled that they will announce the second big exchange preparing to list TLOS. EOSIO-based social media polling app Lumeos now has a Telos community to conduct polls. Lumeos is available as a mobile app. Sign up at https://lumeos.io. Interestingly, Telos, itself, has built-in polling tools as part of the Trail voting service. It would be very simple to create an opinion polling app utilizing these. Until some enterprising developer decides to make its own version based on Telos, the Telos community on Lumeos is a great option. Our favorite “kinda” money, ACORN UBI tokens are sweeping Telos with their zombie-like infectious fun. Send a friend an ACORN and pretty soon they too will start receiving one ACORN per day. And so on. And so on! It’s Tribbles for Telos! While ACORN tokens are fun and experimental, they haven’t yet had a real use of value. However, today while I was refunding the people who had sent 1 TLOS to the ProveAccount account to help secure their Telos accounts in case of future need to arbitrate (requiring some form of proof of ownership that the ProveAccount method addresses), it occurred to me that, there’s no need to send valuable TLOS tokens in order to record a ProveAccount message on the blockchain. You could do the same thing by transferring ACORN tokens — but with no real value to worry about. 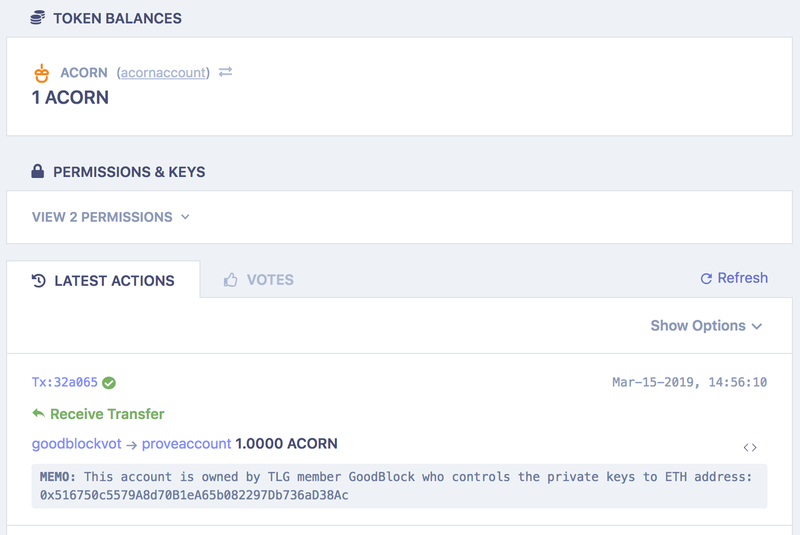 Simply recording the account proof information in the memo of an ACORN transfer, instead of a TLOS token transfer works just as well. So now, ACORNs have their first real valuable use, replacing TLOS tokens for recording information on the blockchain without transferring value. Think of all of the Spam ads that will now be considered large transactions to block explorers because even though they have no real value (or very little now, since this usage actually gives them real value — just very, very little). Any time you want to send a message, write it on an ACORN and give away your nuts! Try it today with the ProveAccount method, using ACORN tokens. The Telos Foundation is sponsoring the EOS World Expo in San Francisco on April 13–14. Hundreds of blockchain fans, developers, and investors are expected to attend the two-day event. 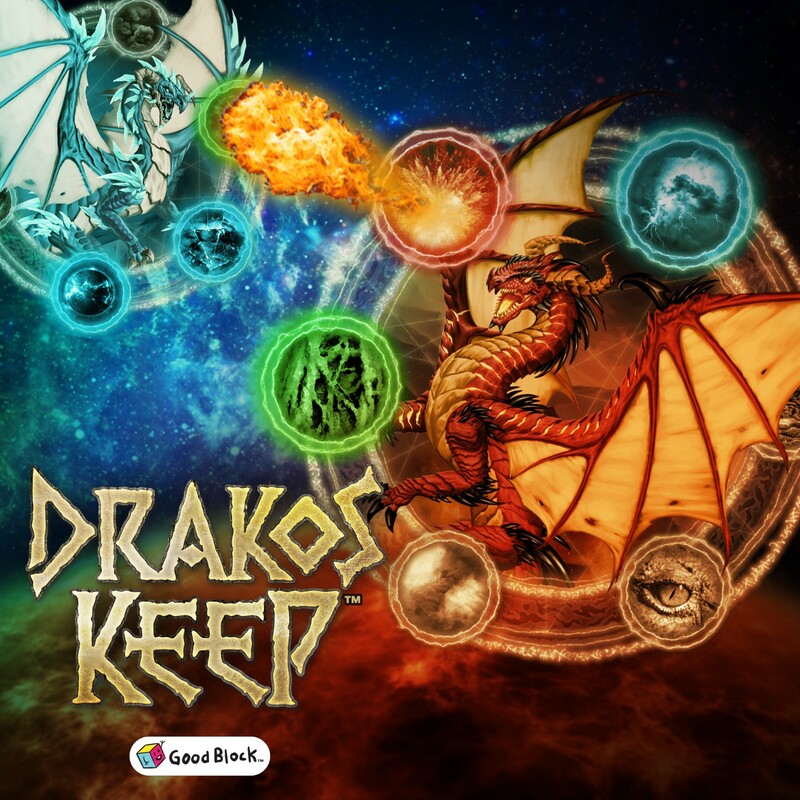 GoodBlock will be there unveiling the first public playable demo from our upcoming, category redefining blockchain game Drakos Keep. Come try it out and maybe get a claim code for your first free dragon egg! About the author: Douglas Horn is the Telos architect and whitepaper author, and the founder of GoodBlock, a block producer and app developer for the Telos Blockchain Network. GoodBlock is a game and app developer, and block producer candidate on the Telos Blockchain Network.